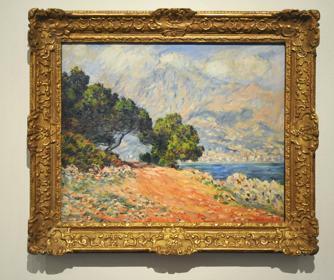 When Paris puts on a major art exhibition with paintings by the likes of Courbet, Cézanne, Van Gogh, Monet, Matisse, Derain, Dufy, Bonnard and others, everyone around the globe knows about it. Millions line up, and the City of Light shines. When Genoa is the venue – in this case, the magnificent, frescoed Palazzo Ducale – no one beyond a radius of 20 miles hears of the show. Once the opening is over, few attend. This is tragic; on the other hand, it’s a boon. Back in Genoa the other day – a perfect, sunny, mild day – we had the exhibition, “Mediterraneo: da Courbet a Monet a Matisse”, to ourselves. Sublime, delighful, gorgeous, inspiring, uplifting, awesome (I said I’d never use “awesome” again but…): These are good words to describe the works. The theme is the Mediterranean’s peculiar light – the light and shadow that impart singular, seductive, ambiguous optical qualities. 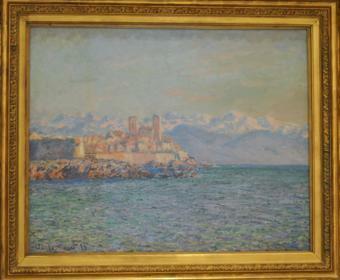 The many Monets include a pair of views – done from the same angle at different times of day – titled “The Fort of Antibes.” Between them hangs Eugène Boudin’s lovely version of the same view, with the same title. 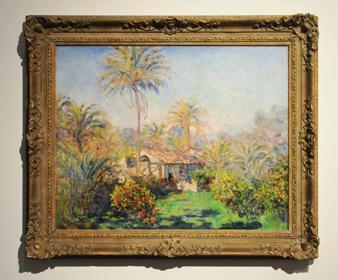 The contrast between Monet’s magical impressionistic technique and the more pictorial yet dazzlingly vibrant Boudin teaches lessons on how to see beyond the pigment. 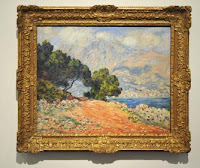 It was in this canvas and others that Monet painted in the winter of 1884 (paintings I describe in one of my early books on Italy) that he discovered the Mediterranean’s shimmering chiaroscuro. 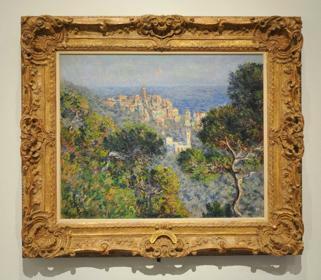 “… Monet left the promenades of Bordighera to wander into the Sasso Valley,” I wrote, “where he was dazzled by the ‘diabolical colors’ of almond and peach trees growing amid palms and lemons and olives ‘in delicious harmony.’” What a treat to see and confirm my supposition! The ‘delicious harmony’ continued after the exhibition over lunch at Sa Pèsta, an old Genoa eatery I discovered in 1976. Their specialty is farinata – the inimitable Ligurian garbanzo-bean tart, baked in a wood-burning oven. 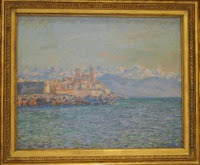 Amazingly, Sa Pèsta has been in business, in the same place, serving the same kind of exquihttp://www.blogger.com/img/blank.gifsitely simple fare, since the days of Monet. Who knows if the French master sat at the table we took, and savored the farinata, crisp on top and moist underneath? One thing’s sure: the light of the Riviera in at least a dozen of the paintings in the show was strikingly like what we enjoyed in Genoa. A perfect day.